If you don’t dig Jesus, or just think the whole world should revolve around you and your needs … well, then, obviously Jesus opinions aren’t important to you. But … the time may come when you run afoul of the law in Panama, or when, rightly or wrongly, you are accused back home of some infraction there, and you end up in the “better” and “protected” area of prison, reserved for expats and foreigners. So even you might find this interesting. This appeared in CAYMANCOMPASS.COM and concerns the death of a Cayman citizen being held in prison in Panama. Cellmates of drug mule Mark Bodden have told of the squalid conditions and nonexistent medical care in the notorious Panama prison where the Caymanian died on Aug. 18. The 37-year-old, according to the witness accounts, was injured in a fall from a makeshift bed in the seriously overcrowded cell block 6 of La Joya prison, where 506 foreign nationals are crammed into tiny rat-infested cells with limited access to clean water or exercise. Three of Mr. Bodden’s fellow prisoners, including Dr. Arthur Porter, a high profile physician wanted in Canada in connection with a bribery scandal involving Montreal’s McGill University Hospital, have been in contact with the Cayman Compass to give their version of events surrounding the death. The Caymanian prisoner was left without access to proper medical attention for nearly 12 hours after sustaining serious head injuries when he fell 8 feet from his “home-made bed space,” according to an unofficial two-page medical report produced by Dr. Porter. “I am of the opinion that if Mr. Bodden had received a prompt transfer to a hospital with neurological competence, he would have had a substantial chance of making a complete recovery,” wrote Dr. Porter, who has been in the prison for 14 months fighting extradition back to Canada following his arrest on an international warrant in Panama City. His report was emailed to the Compass through fellow prisoner Leo Morgan, a British drug dealer locked up for money laundering, who has been representing foreign inmates in talks with prison officials and embassy diplomats in an effort to improve conditions. “Mark was not a bad kid. He made a mistake, did something to make some money and he ended up here. “What happened was an accident, but he didn’t have to die. It could have been prevented if he had got medical care. He died because of neglect,” Mr. Morgan told the Compass in a call from the prison’s public phones. The 57-year-old former boxer and nightclub bouncer, described as a “drug kingpin” in British press reports, said he had seen 60 people die during his 10 years in the Panama prison system from accidents, stabbings, fights and disease. “There’s no medical center, there’s not even any water. We have to buy everything we have,” said Mr. Morgan, who competes in boxing bouts with fellow inmates for cash. 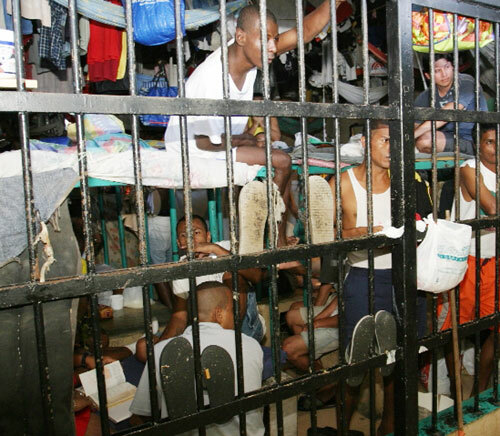 He said the cell block is a 180-bed facility that houses 506 foreign prisoners – a mix of Colombians, Africans, Jamaicans, Guatemalans and three British citizens: Mr. Morgan, Mr. Bodden and his cellmate Ben Perschky, who is serving a 112-month sentence for trying to smuggle cocaine out of Panama. Mr. Perschky, speaking to the Compass via instant-messaging service Whatsapp, told how inmates had banged on the cell-block doors and made frantic calls to the British embassy to raise the alarm as Mr. Bodden slipped in and out of consciousness throughout the night. Mr. Perschky, one of six inmates who shared a cell with Mr. Bodden and bunked on the bed below, said he became seriously concerned when his friend began to experience convulsions. “We carried him to the door. He was in a really, really bad way. We banged and banged on the door and at 8:30 a.m. Sunday a policeman came and opened it and they took him away. Monday morning we heard he had died. In his report – a typed manuscript of his medical notes on the incident – fellow prisoner Dr. Porter, the former medical director of McGill University Health Centre, expresses similar opinions. He describes how he attempted to “medically manage” the patient, who was suffering epileptic seizures, while others tried to raise the alarm. “At around 8:30 am a policeman arrived and the patient was placed in a food trolley and wheeled out. On Monday 18th August I was informed that Mark had died. Frankly I am of the opinion that the care that Mark received was sub-standard,” Dr. Porter wrote. Dr. Porter was injured himself during a riot at the prison – widely reported in Canadian news media earlier this month. The Sierra Leone-born doctor is a prominent figure in Canada where he was a member of the Privy Council and served as chairman of the Security and Intelligence Review Committee under Prime Minister Stephen Harper. He has been in La Joya since being arrested at the airport in Panama City on an international warrant in May 2013. He is wanted by Quebec police in connection with a $22.5 million bribery and kickback scandal, described in media reports as one of the largest frauds in Canadian history. Dr. Porter is facing charges of fraud, conspiracy to commit fraud, fraud toward the government, breach of trust, participating in secret commissions and laundering proceeds of crime, according to Canadian media. There is a sense in which you can judge a nation based on how it treats its prisoners. If that is the case both Panama and the US fall short. This entry was posted in living in Panama and tagged baby boomer retirement, Ben Perschky, boomer retirement, Boomers, crime in Panama, Dr Arthur Porter, Escape Artist, Escape to Panama, Escape To Paradise, Escape To Paradise Living & Retiring In Panama, expat, expat in Panama, Expat Panama, expats in prison in Panama, foreigners held in Panama prisons, International Living, Leo Morgan, living abroad, living in Panama, Mark Bodden, Moving to Panama, Panama, panama prisons, prisons panama, Retirement, Retirement in Panama, Richard Detrich, THE BEST OF RICHARD by Richard Detrich. Bookmark the permalink.